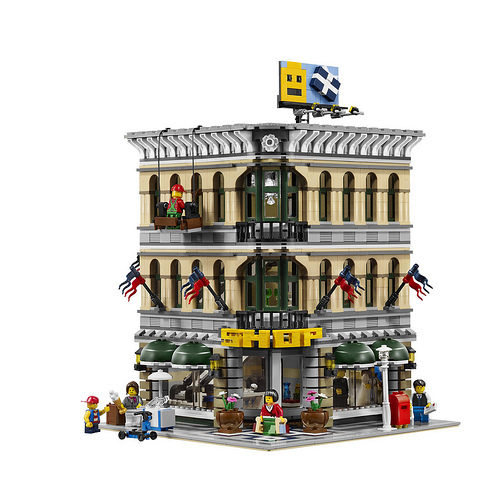 Contrary to some of the earlier reports about its release date, LEGO has informed us that 10211 Grand Emporium is due out next Monday, March 1st, 2010. The LEGO® Modular Buildings series continues with this spectacularly detailed 3-story department store, designed in a realistic scale with lots of special building techniques and rare pieces. On the street outside, citizens carry shopping bags, send letters at the mailbox, admire the window mannequins, and cool off at the ice cream stand while a busy window washer works above. Enter through the revolving door to discover a ground-floor clothing department, complete with a cash register, fitting room, hats, jewelry, perfume, and even a selection of spare trousers. A brick-built escalator carries customers to the second floor housewares department with glassware and golden plates for special occasions, and then it’s up to the top floor for the toy department (complete with toy house and push-scooter) and a great big chandelier above the open atrium. Up on the roof are a billboard and skylight. Includes 7 minifigures and measures 15″ (38 cm) high and 10″ (25 cm) wide. Ages 16+. 2,182 pieces. Includes 7 minifigures: 1 window cleaner, 1 female shop assistant, 1 genetleman and 1 lady with shopping bags, 1 boy plus 1 male and 1 female mannequin! Enter the Grand Emporium through a revolving door that really spins! The first floor has a clothing department with cash register, fitting room, hats, jewelery, perfume and more! The second floor has a housewares department with glassware and golden plates! 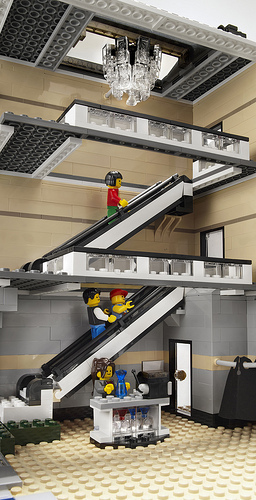 Take the amazing brick-built escalator to the top floor of these 3-story department store! The top floor is a toy department complete with toy house and push-scooter! Grand Emporium features a big chandelier above the open atrium and even a skylight! Lots of realistic details with a rooftop billboard and shoppers with shopping bags! Raise and lower the window washer outside the building! Send letters at the mailbox outside the Grand Emporium! Admire the window mannequins from the street and stop at the ice cream stand for a treat! Includes new inverted arches and rare elements like transparent 1×1 ‘headlight bricks’ and dark green windows! Combine with other modular buildings like 10197 Fire Brigade and 10185 Green Grocer! Measures 15″ (38 cm) high and 10″ (25 cm) wide! it’s a very nice build. Woohoo! Trans clear headlight bricks! Legos Website is still saying March 19th. I happen to be off from work on Monday. Do you think the Lego Stores will have it on the 1st? You guys are awesome, thank you for the quick response. Its hard for me to find time to build, and if I can get this locally on my day off that is what I need to do. But I assure you that going forward I will be clicking on this site before I buy anything. Thanks again!! Ordered! And before you pester me Andrew, yes I did click through here. Just got back from the Lego store in Bridgewater, NJ and they have a ton of them in stock.